Durango Colorado is a crossroads, if you will, of the great Southwest United States. From Albuquerque, New Mexico, it's about at 3 1/2 hour drive through the high desert of northern New Mexico. If you're coming from Phoenix, Arizona, drive time is about 7 1/2 hours through Arizona forests and deserts and passing Grand Canyon National Park. From Dallas, Texas, the drive time will vary between 13 and 14 hours depending on scenic routes vs. shortest drive time. Once you are in Durango, The Historic Durango & Silverton Narrow Gauge Railroad Depot and Museum are right downtown at the south end of Main Avenue at 5th Street, and the Durango Welcome Center, which is loaded with helpful information on activities and attractions, is at the Corner on Main Avenue and 8th Street. Mesa Verde National Park, one to the area's most treasured and Historically significant destinations is a World Heritage Site, and is just 40 minutes west on Highway 160 from downtown Durango. 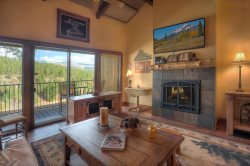 Purgatory Resort is about a 30 minute drive north from Durango on US Highway 550, and continuing further north you will see breathtaking Rocky Mountain views while driving through the scenic San Juan National Forest eventually taking you to Silverton, Colorado. Continuing on this drive which leads to the towns of Ouray, Telluride, Dolores, and Mancos over spectacular mountain passes is known as the San Juan Scenic Byway; a very popular scenic drive in Summer and Fall. The downtown office of Vacation Accommodations of Durango is located at the corner of Main Avenue and 8th Street upstairs in the Historic Graden Mercantile Building, owned by the same family for over 130 years. The address is 777 Main Avenue, Suite 206. Be sure to call before stopping by, as we are frequently out of the office at vacation home locations.